Egypt's Army Chief of Staff Mohamed Farid has called on Egyptian President Abdel-Fattah El-Sisi to extend the Operation Sinai 2018 beyond the three-month timeframe for establishing security in northern Sinai that is due to expire in late February. In November, following a terrorist attack that killed hundreds of worshippers at a North Sinai mosque, El-Sisi mandated the army's chief of staff to restore security and stability in the restive northern part of the Sinai Peninsula within three months. In a speech on Sunday, during the inauguration of the East of the Suez Canal Counter-Terrorism command, Farid urged the president to extend Operation Sinai 2018 to ensure that the Sinai Peninsula is purged of terrorism and all terrorist elements eliminated. The counter-terrorist operation, which was launched on 9 February, involves land, naval and air forces, as well as the police and border guards. It targets "terrorist and criminal elements and organizations" in northern and central Sinai, as well as parts of the Nile Delta and the Western Desert, as announced by the military at the start of the operation. The army’s chief of staff explained that the reason for his request was the preparations being made on the ground by terrorist elements. “We have been preparing for this operation since your [November] mandate, but when it comes to execution, we are carrying out the operation on the ground against elements that have implemented several preparations underground, with warehouses that include highly explosive materials in residential areas. The forces face such elements in these [residential] areas, which makes it difficult for us to inspect them," he told El-Sisi, who attended the inauguration dressed in military uniform. Farid added that the armed forces aim to protect the people of Sinai, appealing to El-Sisi to extend the operation beyond the three-month deadline of late February. 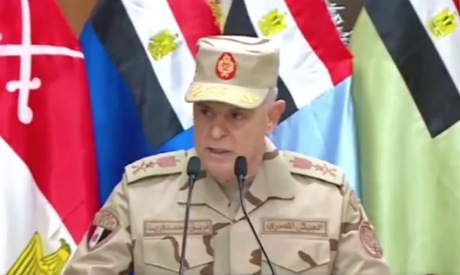 Farid also highlighted plans by terrorist elements to expand the use of improvised explosive devices, car bombs, snipers, and grenades, due to the inability of militant units to engage in direct confrontation with the armed forces in Sinai. Since the launch of Operation Sinai 2018, the Egyptian military says it has killed 71 takfiris and arrested 1,852 suspects. The Arabic word "takfiri" refers to extremist Sunni Muslims who accuse other Muslims of being infidels, often as a justification for using violence against them.